.357 Magnum cartridges; the one on the left contains a softpoint, and the other a hollow point bullet. A bullet is a solid projectile propelled by a firearm or air gun, normally made from metal—usually lead. A bullet (in contrast to a shell) does not contain explosives, and damages the intended target solely by imparting kinetic energy upon impact. The word "bullet" is sometimes used incorrectly to refer to the loaded combination of bullet, cartridge case, gunpowder, and primer (also sometimes called a percussion cap), but this is more properly known as a cartridge or round. The Oxford English Dictionary definition of a bullet is "a projectile of lead ... for firing from a rifle, revolver etc," but nowadays bullets are sometimes made of materials other than lead. All-copper bullets are now available and are sometimes used in high powered rifles for hunting, especially of large animals. Plastic or rubber bullets are used for crowd control or other purposes. Bullets of iron, steel, bismuth, depleted uranium, or other metals have also sometimes been made and used. What bullets have in common is that they are single projectiles—as opposed to birdshot or buckshot, multiple small balls fired together as a shot charge—designed to be fired from a firearm, usually a rifle or pistol, but also possibly a small caliber machine gun. The large projectiles fired from military weapons, such as tanks, cannons, or naval guns, are not usually called bullets. Originally, bullets were round metallic or stone balls placed in front of an explosive charge of gunpowder at the end of a closed tube. As firearms became more technologically advanced, from 1500 to 1800, bullets changed very little. They remained simple round lead balls, called rounds, differing only in their diameter. The rifled bore the muzzle-loaded rifle made loading round shot difficult and time-consuming. "Bullet" is derived from the French word boulette which roughly means "little ball." The original musket bullet was a spherical lead ball wrapped in a loosely-fitted paper patch which served to hold the bullet in the barrel firmly upon the powder. The muzzle-loading rifle needed a closely fitting ball to take its barrel's rifling grooves. This made loading difficult, particularly when the bore of the barrel was dirty from previous firings. During the first half of the nineteenth century, there was a distinct change in the shape and function of bullets. One of the first pointed or "bullet-shaped" bullets was designed by Captain John Norton of the British Army in 1823. Norton's bullet had a hollow base which expanded under pressure to catch the rifling grooves at the moment of being fired. However, because spherical bullets had been in use for the last 300 years, the British Board of Ordnance rejected it. Renowned English gunsmith William Greener invented the Greener bullet in 1836. It was very similar to Norton's bullet except that the hollow base of the bullet was fitted with a wooden plug which more reliably forced the base of the bullet to expand and catch the rifling. Tests proved that Greener's bullet was extremely effective. However, it too was rejected for military use because it was judged as being too complicated to produce. An 1855 design sketch for a "Minie ball" bullet. The soft lead bullet that came to be known as the Minié ball, (or minnie ball) was first introduced in 1847 by Claude Étienne Minié (1814? - 1879), a captain in the French Army. It was nearly identical to the Greener bullet. This bullet was conical in shape with a hollow cavity in the rear, which was fitted with a small iron cap instead of a wooden plug. When fired, the iron cap would force itself into the hollow cavity at the rear of the bullet, thereby expanding the sides of the bullet to grip and engage the barrel's rifling. The Minié ball first saw widespread use in the American Civil War. More than half of the battlefield casualties in this war were caused by Minié balls fired from rifles. Between 1854 and 1857, Sir Joseph Whitworth conducted a long series of rifle experiments, and proved the advantages of a smaller bore and, in particular, of an elongated bullet. The Whitworth bullet was made to fit the grooves of the rifle mechanically. 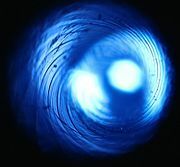 About 1862, W. E. Metford carried out an exhaustive series of experiments on bullets and rifling and soon invented a system of light rifling with increasing spiral, together with a hardened bullet. The combined result of these inventions was that in 1888 the Lee Metford small-bore (".303") rifle, Mark I, was adopted for the British army. An example of a pointed spitzer round for a rifle (left) and a round nosed (non-spitzer) round for a pistol (right). In 1883, Major Rubin, director of the Swiss Laboratory at Thun, invented the copper-jacketed bullet; an elongated bullet with a lead core in a copper envelope or jacket. The next development was the spitzer—a German name for a tapered, aerodynamic bullet design used in most intermediate and high-powered rifle cartridges. By the beginning of the twentieth century, most world armies had begun to transition to spitzer bullets. These bullets flew for greater distances, carried more energy because they had less air resistance, and were more accurate than their predecessors. The final advancement in bullet shape occurred with the development of the boat tail bullet, which is a bullet with a streamlined base. A vacuum is created when air strata moving at high speed passes over the end of a bullet. The streamlined boat tail design aims to eliminate this drag-inducing vacuum by allowing the air to flow alongside the surface of the tapering end, thus eliminating the need for air to turn around the 90-degree angle normally formed by the end of shaped bullets. 5. the primer, which ignites the propellant. Today, some bullets for high powered rifles are given a thin film or coating of some material—usually molybdenum disulfide, often known as moly—over their copper jackets to further ease their travel down the rifle barrel and decrease the build-up of copper fouling in the bore. Bullet designs have to solve two primary problems. They must first form a seal with the gun's bore. The worse the seal, the more gas generated by the rapid combustion of the propellant charge that leaks past the bullet reducing the efficiency. The bullet must also engage the rifling without damaging the gun's bore. Bullets must have a surface which will form this seal without causing excessive friction. What happens to a bullet inside the bore is termed internal ballistics. A bullet must also be consistent with the next bullet so that shots may be fired accurately. Once it leaves the barrel, it is governed by external ballistics. Here, the bullet's shape is important for aerodynamics, as is the rotation imparted by the rifling. Rotational forces stabilize the bullet gyroscopically as well as aerodynamically. What happens to the bullet on impact is dictated partly by the design of the bullet and partly by what it hits and how it hits it. Bullets are generally designed to penetrate, deform, and/or break apart. For a given material and bullet, which of these happens is determined partly by the strike velocity. Actual bullet shapes are many and varied today, and an array of them can be found in most reloading manuals and bullet catalogs. Some typical present day bullets, from left: .22 long rifle rimfire cartridge with 40 grain round nose lead bullet; 40 gr. lead bullet pulled from a .22 long rifle cartridge; 40 gr. .22 cal (.224 diameter) Sierra Varminter hollow point; 52 gr. .224 Sierra Matchking (target) hollowpoint boat tail; 60 gr. .224 Berger hollow point match; .25 cal. (.257) 100 gr. Hornady Interlock spitzer; .30 cal. (.308) 125 gr. Nosler Ballistic Tip with polycarbonate tip; .30 cal. 150 gr. Sierra boat tail spitzer; .30 cal. 165 gr. Speer boat tail spitzer; .30 cal. 168 gr. Sierra Matchking (target) hollow point boat tail; .30 cal. 180 gr. Remington Core Lokt; .30 cal. 180 gr. Nosler Partition; .30 cal. 180 gr. Speer Grand Slam; .30 cal. 180 gr. Barnes XLC (pure copper, coated); .30 cal. 200 gr. Speer spitzer; .30 cal. 200 gr. Nosler Accubond; .375 cal. (.375) 300 gr. Hornady full metal jacket, moly coated; .50 cal. (.500) 295 gr. hollow point with plastic skirt for muzzle loaders. Bullets were classically molded from pure lead. Lead is widely used in bullet making to this day because it is highly dense, thereby providing a high amount of mass—and thus kinetic energy—for a given volume. Lead is also relatively cheap, easy to obtain, and melts at a low temperature, making it easy to use in fabricating bullets. For relatively low muzzle velocities—around 800 feet or less per second up to about 1,300 feet per second—a bullet of pure lead will work. As the velocity increases, so does the problem of the melting and disintegration of the lead bullet from the heat of firing and the friction of moving through the barrel. One way to solve that problem is to add some other metal—typically tin or antimony or some combination of those—to the lead, making an alloy that is harder and has a higher melting temperature than pure lead. This can work for velocities as high as about 2700 feet per second. Jacketed Lead: Bullets intended for higher-velocity applications (above about 1900 feet per second) generally have a lead core that is jacketed or plated with cupro-nickel, copper alloys, or steel. The thin layer of harder copper protects the softer lead core when the bullet is passing through the barrel and during flight; this allows delivery of the bullet intact to the target. Full Metal Jacket (FMJ) bullets have the front and sides of the bullet completely encased in the harder metal jacket. (Nearly all military bullets are of FMJ type, as are many bullets for autoloading handguns, and some others for various purposes.) Some bullet jackets do not extend to the front of the bullet, to aid in expansion and thus increase lethality. These are called softpoint or, if there is a cavity in the front of the projectile, hollowpoint bullets. 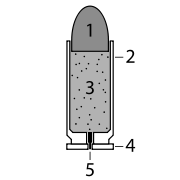 More recent examples of jacketed bullets may have a metal or a polycarbonate plastic insert at the tip that serves to protect the tip from deformation and act as an expansion-starter on bullet impact. (The Remington Bronze Point and Nosler Ballistic Tip are some examples.) Still another variation is the bonded bullet, in which there is a strong chemical bond between the copper jacket and the lead core of the bullet so that the bullet does not come apart or disintegrate on impact. (Nosler Accubond and Hornady Interbond bullets are examples of bonded bullets.) Steel bullets are often plated with copper or other metals for additional corrosion resistance during long periods of storage. Synthetic jacket materials such as nylon and teflon have been used with some success. H-type. Here the jacket has a two cavities, a front one and a rear one. The forward part covers the front of the bullet and behaves as a conventional exposed-lead softpoint. The rear part is filled with lead and behaves like a full metal cased bullet. On impact, such a bullet mushrooms at the front, but the mushrooming cannot go beyond the front part of the bullet. Thus, the bullet can be counted upon to retain a substantial amount of its weight and to penetrate deeply. The German H-Mantel, the Nosler Partition, and the Swift A-Frame are some examples of this design. Armor Piercing. Jacketed designs where the core material is a very hard, high-density metal such as tungsten, tungsten carbide, depleted uranium, or steel. Rubber bullets are designed to be non-lethal. Tracer. These have a hollow back, filled with a flare material. Usually this is a mixture of magnesium perchlorate, and strontium salts to yield a bright red color, although other materials providing other colors have also sometimes been used. Such ammunition is useful to the shooter as a means of verifying how close the point of aim is to the actual point of impact, and for learning how to point shoot moving targets with rifles. Less than Lethal. Rubber bullets, plastic bullets, and beanbags are designed to be non-lethal, for example for use in riot control. They are generally low velocity and are fired from shotguns, grenade launchers, paintball guns, or specially-designed firearms and air gun devices. Non Toxic. Bismuth, tungsten, steel, and other exotic bullet alloys prevent release of toxic lead into the environment. Regulations in several countries mandate the use of non-toxic projectiles or shot especially when hunting waterfowl. Bullet specifications are usually given in three parameters: (1) Diameter (caliber) of the bullet. In the US and parts of the former British Commonwealth, this is usually expressed in thousandths of an inch, but elsewhere in the world usually in millimeters (one inch = 25.4mm). (2) Weight of the bullet. In the U.S. and parts of the former British Commonwealth, this is usually given in grains (one avoirdupois pound = 7000 grains), but elsewhere in the world it is usually given in grams (one gram = 15.43 grains). (3) Type and shape of the bullet, such as "lead round nose," or "jacketed round nose," or "jacketed spitzer hollow point," or "full metal jacket round nose" or "wadcutter" or whatever other designation may be pertinent for a particular bullet. When a bullet is fired in a rifle or pistol, the lands of the barrel (the raised spiral ribs in the barrel that impart spin to the bullet when it is fired through that barrel) impart grooves in the jacket or the outside of the bullet, and if the bullet is recovered sufficiently intact, those grooves will be visible on it. The diameter (caliber) of a bullet is especially important, as a bullet of a given caliber must be used in a rifle or pistol that has a barrel of that given caliber. A common caliber for small arms throughout the world, for example, is .30 caliber (7.62mm). This means that the barrel has a hole of .300 inches in diameter before the rifling is cut or made into it—this is usually called the bore diameter. After the rifling (spiral grooving) is cut or impressed into the barrel, the diameter measured from the bottom of the grooves is generally .308 inches—this is usually called the groove diameter. Bullets need to be made to the groove diameter. This means that bullets for .30 caliber rifles actually measure .308 inches in diameter. The groove diameter is usually .007 or .008 inches larger than the bore diameter for any given caliber. There are, for example, many different .30 caliber rifles: the .30 carbine, the .30-30 Winchester, the .300 Savage, the .30-06 Springfield, the .308 Winchester (also known as the 7.62 NATO), the 7.62 X 39mm (the original caliber of the AK 47 assault rifle), the .308 Norma magnum, the .300 Weatherby magnum, and many others. These rifles differ greatly in power and thus in the velocity that they impart to bullets, but they are alike in that they all use bullets that measure .308 in diameter. 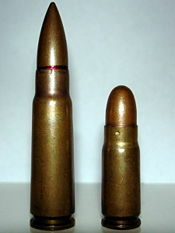 Some cartridge designations use the actual bullet (or groove) diameter. Some examples are the .308 Winchester, .338 Winchester Magnum, and the .375 Holland & Holland Magnum. In the case of some calibers and cartridges, the designations are confusing. In handguns, the 9 mm (also known as 9mm Luger or 9mm Parabellum), .38 Special, .38 ACP, .38 Super, and .357 Magnum, for example, all use bullets that measure .357 in diameter. With the German 8 x 57 mm (8mm Mauser) military rifle, there were actually two different calibers: an earlier one using a bullet that measures .318 inches in diameter, and a later one using a .323 inch diameter bullet. The first is usually designated 8 x 57 J (or sometimes 7.9 x 57) and the latter (the .323 one) is usually designated 8 x 57 S or 8 x 57 JS. Most of the service weapons of WWII were the S-type (.323 diameter). Hunting bullets are usually chosen based on the size of the animal to be hunted and the distance at which the shot is likely to occur. For hunting, a bullet needs to be sufficiently strongly constructed to penetrate to vital organs of the hunted animal, but also able to "open up" or "mushroom," thus transferring its energy within the animal in order to cause death as quickly as possible and minimize suffering of the animal. Less penetration is needed for smaller animals and more penetration for larger ones. Heavier (for a given caliber) bullets tend to penetrate more and thus are generally used for larger animals. Round nose bullets are extremely effective at shorter ranges (about 100 yards or less) but spitzer bullets keep their velocity better and thus are better choices for longer ranges. Target shooters do not care about the penetration or performance of the bullet upon impact, but only on its accuracy. Thus, they choose bullets that give them the best accuracy (i.e. that result in putting a series of shots as close together as possible) in their given rifle or handgun. In practice, target bullets for high powered rifles are usually of hollowpoint boattail design. Some handgun target shooters use so-called wad cutter bullets. Those have a front that is almost flat to the edge, and they perform like a paper punch, making very distinct round holes in the paper target. Wad cutter bullets have extremely poor aerodynamic properties, so they are usually used for very short ranges of about 25 yards or less. Today, RCBS, Lyman, Lee, Saeco, and other makers offer bullet molds in many calibers and shapes to create many different molded lead or lead alloy bullet designs, starting with the basic round ball. Also, by using a bullet mold, bullets can be made at home for reloading one's own ammunition, where local laws allow. Hand-casting, however, is only time and cost effective for solid lead or lead alloy bullets. Both cast and jacketed bullets are commercially available from numerous manufacturers for handloading and are much more convenient than casting bullets from bulk lead. If a shooter handloads (i.e. loads his or her own ammunition) he has the ability to choose any bullet of the appropriate caliber for whatever caliber rifle or handgun for which he is loading, and he can load it to a range of velocities, depending on the type and amount of gunpowder used in the load. If the shooter does not handload—handloading is very popular in the United States and Canada, but is less so in Europe, Asia, and Latin America, and is actually forbidden in some countries of the world—he is restricted to whatever factory loaded ammunition he or she can find for his or her rifle or handgun. In practice, most hand loaders for rifles and handguns buy bullets supplied by one of many manufacturers, including Barnes, Berger, Hornady, Nosler, Remington, Sierra, Speer, Winchester, and others in the U.S., Woodleigh in Australia, Lapua or Norma in Europe, or various other European or South African manufacturers. Very large quantities of bullets are made in numerous other countries also, including China and Russia, but are generally available only in factory loaded ammunition—sometimes available only to military or law enforcement users—and are usually not sold for handloading use. The Geneva Accords prohibit military use of softpoint (left) and hollowpoint (right) bullets such as these. The Geneva Accords on Humane Weaponry and the Hague Convention prohibit certain kinds of ammunition for use by uniformed military personnel against those uniformed military personnel of opposing forces. These include projectiles which explode within an individual, poisoned and expanding (i.e. hollowpoint or softpoint) bullets. Nothing in these treaties prohibits incendiary bullets (tracers) or the use of prohibited bullets on military equipment. These treaties apply even to .22 long rifle rimfire bullets used in pistols. Hence, for .22 rimfire pistols used during World War II, special bullets were developed that were full metal jacketed, in place of the unjacketed simple lead bullets that are more commonly used in .22 long rifle rounds. ↑ Bullet definition, Lexico Publishing Group, LLC, 2008. Retrieved February 20, 2008. Johnson, Steve (ed.). Hornady Handbook of Cartridge Reloading: Seventh Edition. Grand Island, Nebraska: Hornady Manufacturing Company, Inc., 2006. Lapua Shooting And Reloading Manual 2nd Edition, Lapua, Finland: Lapua, 2000. Lyman 48th Edition Reloading Handbook, Middletown, CT: Lyman Products Corp., 2003. Nosler Reloading Guide, Fifth Edition, Bend, Oregon: Nosler, Inc., 2002. Speer Reloading Manual, Number 14. Lewiston, Idaho: Speer, Inc., 2007. European Ammunition Box Translations. www.rawles.to. The Perfect Big Game Solid By Pierre van der Walt. www.gsgroup.co.za. This page was last modified on 21 December 2016, at 16:09.